Nikon D7200 is a new DX format DSLR camera released in early 2015. D7200 is the successor of Nikon D7100. The price of Nikon D7200 starts at $1,196.95. Featuring a 24.2MP CMOS sensor which lacks an optical low-pass filter, and an EXPEED 4 image processor, the D7200 is able to record up to 6 fps at full-resolution, or 7 fps at a 1.3x crop, with a 100-frame buffer for extended high-speed shooting. Today, we are showing you recommended lenses for Nikon D7200 DSLR camera. 35mm, 50mm lenses are the most popular prime lenses for Nikon D7200. The new released Sigma 50mm f/1.4 DG HSM Art lens and Sigma 35mm f/1.4 DG HSM Art lens are of course the best prime lenses for Nikon D7200, but the price is not cheap. The AF NIKKOR 50mm f/1.4D and AF-S DX Nikkor 35mm f/1.8G are great lenses at a very cheap price. Other recommended lenses are Sigma 50mm f/1.4 EX DG HSM lens and AF-S NIKKOR 50mm f/1.4 G lens. 85mm, 90mm, 100mm, 105mm, 135mm prime lenses are very good lenses for portrait photography, of course the best one should be the Zeiss Otus 85mm f/1.4, but the price is very expensive. The AF-S NIKKOR 85mm f/1.4G is another great lens. If you are looking for a cheap lens, you can try AF-S 85mm f/1.8G and new released Samyang 135mm f/2 ED UMC. There are a lot of good standard zoom lenses for Nikon D7200 DSLR camera. The best 24-70mm lens is Tamron SP 24-70mm f/2.8 DI VC USD lens, this lens is cheaper than AF-S NIKKOR 24-70mm f/2.8G ED lens, but image quality is better. If you looking for a cheap lens, there also some good choices: AF-S NIKKOR 24-85mm f/3.5-4.5G ED VR, AF-S DX NIKKOR 18-140mm f/3.5-5.6G ED VR and AF-S DX NIKKOR 16-85mm f/3.5-5.6G ED VR. If you are looking for a wide-angle prime lenses, the Sigma 24mm F1.4 DG HSM A lens is the best chocie. For cheap lenses, the AF-S NIKKOR 20mm f/1.8G ED and AF-S NIKKOR 28mm f/1.8G are both good wide-angle prime lenses for Nikon D7200. From the list, it is clear that the Sigma 18-35mm f/1.8 DC HSM lens is the best wide-angle lens, even better than AF-S DX NIKKOR 17-55mm f/2.8G ED-IF lens. The Tokina 11-20mm and 12-28mm wide-angle zoom lenses are cheap and great lenses for Nikon D7200. For the Telephoto Prime lenses, the best one is the new released AF-S NIKKOR 300mm f/4E PF ED VR lens. Below are top rated 70-200mm telephoto zoom lenses for Nikon D7200 camera, the best ones are also from Nikon and Tamron, Tamron SP 70-200mm f/2.8 is much cheaper than AF-S Nikkor 70-200mm f/2.8G, but also has great image quality. If you are looking for a cheap telephoto zoom lens, AF-S VR Zoom Nikkor 70-300mm f/4.5-5.6G IF-ED is your best choice. The Sigma 150-600mm and Tamron 150-600mm are both super telephoto zoom lens for Nikon D7200. If you are looking for an all-in-one zoom lens for your Nikon D7200, the AF-S DX 18-300mm is the best. The Sigma 18-300mm and Tamron 16-300mm are also both good lens with a cheaper price. If you are looking for a Macro lens for Nikon D7200. Below are top choices for you. 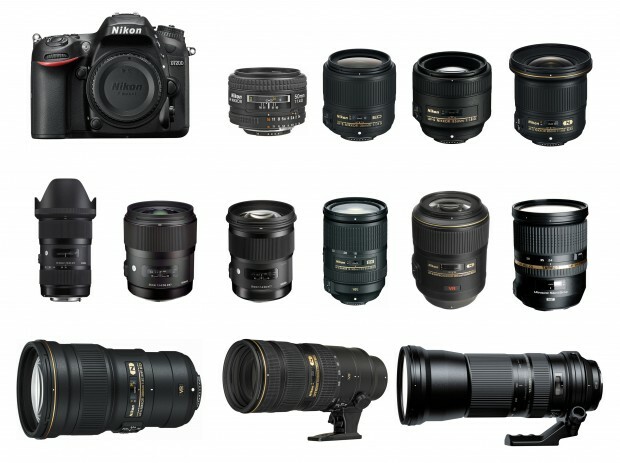 Of course the best one is AF-S VR Micro-NIKKOR 105mm f/2.8G lens. If you are looking for a cheap lens, the AF-S 60mm f/2.8G ED and AF-S 40mm f/2.8G are both great macro lenses for Nikon D7200.